At the same time, the tough economic conditions meant the trend for beer drinkers to trade up to premium brands had slowed, and many had gone back to cheaper brews. And many consumers were saving money by having a drink at home rather than going out at night. Blake estimated overall beer consumption declined 4-5% in the year to September, compared with the previous year. “It’s been a huge category shift and I’ve never seen that sort of momentum before in the market,” Blake said. The biggest week on the New Zealand beer calendar is over. The BrewNZ Beer Awards attracted a record number of entries while Beervana attracted a record number of attendees. The winners were honoured at the awards dinner last Thursday and the full results are now up on the Brewer’s Guild website. The highlight of the evening was Emerson’s Brewing Company being crowned Champion Brewery 2009. The role of the Ministry of Foreign Affairs has been occasionally described by outsiders as ‘drinking for one’s country.’ It was therefore slightly surprising that it had been a couple of years since I had last run a beer tasting session for the MFAT social club. The organiser of the previous event is, rather ironically, now posted to a completely dry country though I’m sure there is no causal relationship. Finally, to the hundreds of correspondents who almost over-loaded the Real Beer server with emails wanting to know what happened to Beer Haiku Friday, you will be pleased to learn that normal service will resume this week. More than 340 beers from New Zealand and overseas breweries are entered in this year’s BrewNZ Beer Awards, New Zealand’s premier beer competition, up from 205 entries last year. The Awards, which have also attracted about 150 international entries from Australia, United States, Pacific Islands and Russia, have brewers striving to brew the perfect beer. Led by US-based judge Dave Logsdon, a panel of judges will convene in Wellington to assess entries over three days from Sunday 22 August, with the BrewNZ Beer Awards Dinner to be held on Thursday 27 August. It is perhaps fitting that the son of a famous winemaker heads a brewery which blurs the line between wine and beer. 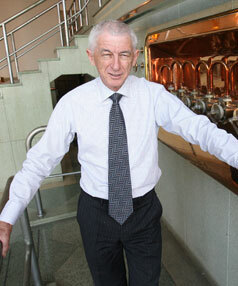 Moa beer is the brainchild of Josh Scott, son of Allan Scott, the founder of Allan Scott Wines. An accomplished wine maker himself, the implausibly youthful Josh has incorporated several wine making techniques into his range of beer including elements of the “methode traditionelle” used in making Champagne. Beer awards are a bit like boxing tournaments. Just as a heavyweight fighting a flyweight would be a gross mismatch, it is hard to objectively judge the respective merits of a chocolately London Porter against a hoppy New World Pale Ale. Accordingly, beers are entered into one of ten classes (each with numerous sub-classes) so that like can be assessed against like. Such is the ethos of extreme beers, an all-American genre in which brewers are engaged in a constant game of “Can you top this?” Whether using an inordinate amount of traditional ingredients like malt or hops, or adding flavorings undreamed of by Old World brewers, American brewers have created a signature style that beer enthusiasts seem both to love and hate. Finally, for the hordes of people who wrote in clamouring for the return of Beer Haiku Fridays, rest assured this popular feature will resume tomorrow! Early Bird entries are now closed for the BrewNZ Beer Awards with 158 beer entries being received. Final entries close 15th August 2007. Deadline for beer samples is 31st August 2007.